It could start with "you never think it can happen to you," or "just when you thought it was safe." But why go out that way or for that matter come in that way, it's as cliche as an American tourist getting yapped for his belongings on a trip to foreign country. A red-headed graduate student who couldn't be more American if she was Betsy Ross' daughter's daughter's daughter's daughter, was sitting there talking to me. More aptly talking at me, more specifically, not shutting up. Uh-huh, yeah, damn that's messed up is all this blogger could manage to retort. She talked about her work in psychology and feigned embarrasment went I pointed out that she had on flip-flops that said "Harvard," and a key chain necklace that said, guess what "Harvard." Oh yeah, someone had broke into the Hostel I had just arrived at in San Jose, Costa Rica and stole her passport and she was killing time on her way to Vietnam via South Dakota. The lame conference on Commodities and Chinese relations with Latin American governments and the state-owned mines they own is sadly at an end and I'm headed on one of the most beautiful Fridays in recent memory to the famous Jaco Beach on the Pacific coast of this lovely quaint, currency 500/1 - completely-backed-by American-military-country. The bus to Jaco pulls up for boarding and people rush to put their luggage in the hull of the monstorous municpal bus that looks more like a tour bus. Ahh, no way I'm putting my bags down there, sheeeeeeeeet, not me. Savvy yank that guy is right? So what do I do? I get on, speak a little Spanish, I'm in my zone, I'm getting ready for four straight days of God-knows-what-tropical-fun and what do I do? I pull out my digital camera like a dummy tourist from middle America. You know, the quintessential, "do they serve tacos in Costa Rica?" Yeah that kind. I start taking self portraits as the bus pulls off, feeling my self, fun for pennies on the dollar, oh yeah. My black Samsonite leather computer bag is on the top shelf above where I'm sitting, phone, laptop, all the power cords, cuffllinks and a DVD from blockbuster enclosed. I might as well have been a Harvard girl. We're only 20 clicks from the beach, from wireless, phoneless freedom via the wireless connection on a month-old Dell fresh off the assembly line. I was planning to hook it up and surf the net as soon as I got to my condo. Bandit to Jabulani: Uh, no you're not. While I was looking out the window musing at the greenest hills I've ever seen in my life and the mango trees with ripe, juicy products hanging like sweaty jugs - of fruit juice you pervs - it must have jumped off, something slick, James Bondish. I'm talking Michael Jackson smooth criminal. I should have known what was up 45 minutes into the trip when I couldn't see the strap from my bag anymore, but it didn't register. We stop, I look up on the shelf. Panic. Awwww they got me. First step anger, broken cuss-laden Spanish, black English; a real estate agent from South Carolina with the same "damn that's messed up," look on his face that I had for the Harvard girl the night before. Come to find out five collegues had the same hubris and put their stuff below in the belly of the Bus beast. Yes, Gone. And suddenly I didn't feel so bad. I, after all still had my passport, credit cards and a whole lot of Colones on my person and a pre-paid condo waiting on me. Some of those people were stuck where they stood with nothing anyone could do but loan them 500 colones to call the embassy and then their folks. Yep, the beach, healed those wounds quick. Here's also a bit from my Wisebread sistren Nora Dunn on parameters on TI that I neglected to mention due to the dearth of exactitude in my rant/narrative/testimonial. It's a lesson for me, an expensive lesson, but a lesson. I do plan on going back to Costa Rica. I loved it but next time I'm springing for some TI and not the Rapper T.I. either, even though I hear he has lots and lots of guns. Because despite reading numerous travel guides and Wikipedia entries about Costa Rica being the number one destination for passport theives, I put my stuff on the top rack of a public bus to a beach bum paradise. I should be reading your blog. The proper phrase is Pura Vida! 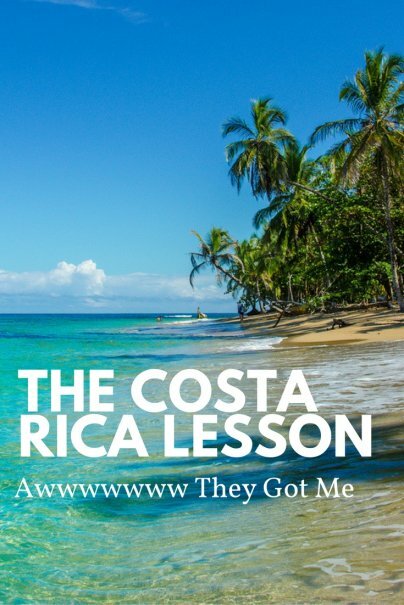 I'm sorry to read that you were robbed in Costa Rica. I was there last summer (including a visit to Jaco) and had no problems. I love the place. Unfortunately, you can get robbed anyplace... even in paradise. I hope the rest of your trip went much better. I barely understood a word of this post. I didn't follow a lot of it either. Good grammar can go a long way to helping your readers comprehend your message. This is ridiculous. I visit this site every day and never have I seen such a terribly written post. Jabulani, you're trying much too hard to be hip and funny. Perhaps you're a capable writer but no one's going to know that by this article. I'm sorry man, but very shortly into this article I was thinking that it wasn't really well written. Kind of hard to follow, with grammatical and spelling mistakes ("hole" instead of "whole" for example). The impulse to share your story is good, but you might want to have a couple people proofread and give feedback before you submit. Thanks for the reminder about practicing awareness while traveling! And yeah, I found this post pretty hard to follow too. The style really overwhelmed the content. Wisebread, could you have an editor take a look at this post? It's incomprehensible. And how about explaining how travel insurance works. Does it cover theft at 100%? This is so poorly written. I'm used to seeing much better on this site. The post could benefit from some editing, it's true, but come ON--it's snappy and funny, and it has a distinctive voice, and it does make its point: travel insurance is a lot cheaper than replacing all of your belongings. The author also links to a long and very specific post about TI and what it covers, if you want more information. This post is more a testimonial than anything else; not every post needs to be a bulleted list. I understood what was being said in the article, completely. Then again, I do associate with a 'younger audience' as it were, and the style of writing was a mature version of their mannerisms. I'm glad that Wisebread has diversified to include Leffall's articles. Not everyone is of the same demographic; we can skip articles by authors we don't enjoy; this is a free web site. The world might be a richer place, if people who wouldn't otherwise look at Wisebread found Leffall's articles to 'speak their language' and decided to try the rest of the authors' works. I thought the article was great, and that the author's "voice" made it much more entertaining. I am still trying to figure out what the heck happened. Are you the Harvard student? If so, they appear to have stopped teaching how to write. This post was painful to read. i never had this problem in CR, probably because i dressed very simply, carried only a beat up backpack, and kept money for the day in my shoe. backpacking through the western side of the country revolutionized my thinking toward "stuff" i carried around while traveling and life in general. i even spent the night in puntarenas before catching the ferry, and had no problems besides making the mistake of eating costa rican chinese food. The first eight commentators helped me confirm what I already knew. Chaos people. Organized Chaos (smile). To Flovebunny. I agree about packing light and what's funny is that I was very bare bones, I had a backpack and a computer bag on the plane trips and as soon as I was done with my suits for the conference I shipped them back to the states. I hate baggage claims. Anyway, I'm going to take an ATV up to Montezuma next time on your advice. Costa Rican chinese food? I don't even eat American Chinese food anymore LOL:) What's interesting is that I should have known better because I kept my passport, credit cards and cash on my person at all times and I had my bag with the toiletries and flip flops and other knock around clothes in it on my lap. I had room to put the computer bag there too. Oh well right? TI may not have recouped everything for me but it at least would have somewhat defrayed the cost of replacing the stuff when I get back stateside. I think I'm going to write more gonzo-style posts and not stop until someone comes on the site and accuses me of being the worst writer ever. I'd love to have that dubious distinction, that means people are reading. That was hilarious Jabulani. Hasta la vista. I don't think this post is poorly written overall. I think the post is partly in AAVE, which suggests that it's grammatical in its language, though there are still a few spelling and word choice errors, etc. I think it's poorly punctuated: commas, quotation marks, etc., would clear up any of the places that I had to read over a couple of times to get. Perhaps it would be interesting to know more about who understands it and who doesn't; then we would know what language to translate it into. Otherwise it was very clear to me and sounded like someone telling a story in person and was a fun change of pace, though I do like the more "article" style posts very much as well. I don't believe that all blogs need to sound completely formal, considering that they grew out of personal diaries. Wow, I can't believe the flak this post is getting for its writing style! Personally, I found it amusing. Now I'm off to read the remix version, which I think will make me giggle out loud. To be honest...I thought his writing style was unique and fine. Yeah, I was confused at points, but you can't tell me half of the stories you read in a college lit class don't confuse the hell out of ya. I was an English writing major and am in law school now...and truth be told, this surpasses a lot of my cohort's work. I admit that it took me some getting used to at first, but if you're at all familiar with his other pieces, this is not at all unusual. Point of the article is good, regardless of what you think of Jabulani's style. It's never nice to hear that someone doesn't like your work, but it's not like those of who were critical went off ranting at the author. He's not the worst writer in the world, but the grammar and sentence structure (and proofreading for typos) could be a whole lot better. I'm all for informative, entertaining stories, but the article above simply does not meet the level of competent writing that I've come to expect from this blog. And I don't care if this is the same caliber of writing that one may find in college classrooms. A lot of people can't write - that just means you're keeping poor company. I'd love to hear more from the author, but only if he gets someone to proofread his work before submission. Pardon me everybody but I thought this piece was about the need for travel insurance. The narrative, unorthodox and unconventional as it may have been, served the purpose of a blog: A quick hit and a smirk with links to useful information. I think he was puposely writing in a conversational sytle. I think he wrote short choppy sentences and one word paragraphs for a purpose. I think some people on here were literally looking for something to pick at and it's not that deep. If you read that "remix" piece, he seems to have turned lemons into lemonade and is just toying with you guys. Besides, at the end of the day, if you read this guy's bio or even google the dude, his record as a writer and journalist speaks for itself. And his click count is up because of all the hate. Keep giving them something to talk about "homeslice." I liked it. But then I like James Joyce and Faulkner too, so there you go. I'd call this stream-of-consciousness writing: more emphasis on tone and feeling, rather than formal structure. It's as if you were really hearing someone's actual thoughts as an event unfolds. I'm not so sure I get the comments about AAVE, jive and ghetto. I wouldn't say it's an example of any of that. I was thinking that the "had broke" or "had stole" construction was AAVE, but I could be confused. I'm guessing people talking about jive were referring to words such as "sheeeet" and "sistren." And using the present (grammatical) tense for past events is, AFAIK, just conversational. Everyone's a critic. In the land of democracy, how we love to pounce on "others". I enjoyed your article; particularly, your wit and writing style. The article has indeed used a very mature languages that spoke for the authors subjective discussion about the travel insurance and the particulars of such protection. It may include writings that are not easily comprehend by others but I think thorough analysis of the ideas will bring to the understanding about the topic he wants to share. His knowledgeable efforts is just expressed in a style of writing that is his own way.